November | 2012 | Could Joseph and Imhotep have been the same person? The Step Pyramid Complex was designed by Imhotep. Some large man made pits that look like grain silos can be found within it’s walls. It is likely that he is the Joseph of the Bible who saved Egypt from a 7yr famine by building grain silos such as these in cities around Egypt. He was able to buy up all the land of Egypt for the pharaoh in exchange for the grain. This would of had to take place early in Egypt’s history. Joseph and Imhotep have many other similarities. For example, they both lived to the age of 110yrs, they were embalmed when they died and given a royal Egyptian burial, they imposed a 20% tax and they both married the daughter of the high priest of On. They both saved Egypt from a 7 yr famine. They were both visiers of non-royal or Egyptian blood. 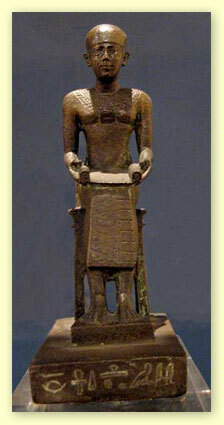 A statue of Imhotep in the Louvre. It is likely that he is the Joseph of the Bible who saved Egypt from a 7yr famine. Grain would have been poured into the top of the pit and servants would have walked down stairs into the adjacent pit to retrieve grain through a small tunnel that connected the bottom of the pits. There can be little doubt that the Djoser complex was a grain distribution and storage center. The Step Pyramid complex at Saqqara Egypt contains grain silos and administrative buildings. Not only was it the first pyramid, it contained the first silos and the first building with columns. It was designed by Imhotep who may have been Jospeh of the Bible. This is the Step Pyramid Complex in Saqqara in Egypt. It was designed by Imhotep in the third dynasty of Egypt for King Netjerikhet (Pharaoh Zozer). It is also known as the Djoser Pyramid or the first pyramid. It is composed of solid Limestone Blocks and as a result, it is in better condition than the 12th dynasty pyramids that were made largely of unfired mudbricks with only a limestone veneer. The buildings are the first known structures to utilize columns in their architecture. The pyramid is part of a complex which contains several interconnected man made pits in the ground, an open courtyard and a number of buildings which were part of a wall that surrounded the compound. The entrance to the complex is through the main buildings. These square and rectangular pits in the ground are likely to have been used to store grain and retrieve it. One of the pits has stairs and connects to the bottom of the main pit which abuts the courtyard on the side opposite the Step Pyramid within the walls of the complex. The pyramids at Dashur and Giza can be seen from the Step Pyramid (and visa versa). The pyramids would have been useful for navigation and finding the complex even if this was not he main reason that they were built. The pyramids became the tombs of the Pharaohs. Previously, they used Mastabas as tombs. Pharaoh Zozer was buried under the Step Pyramid. 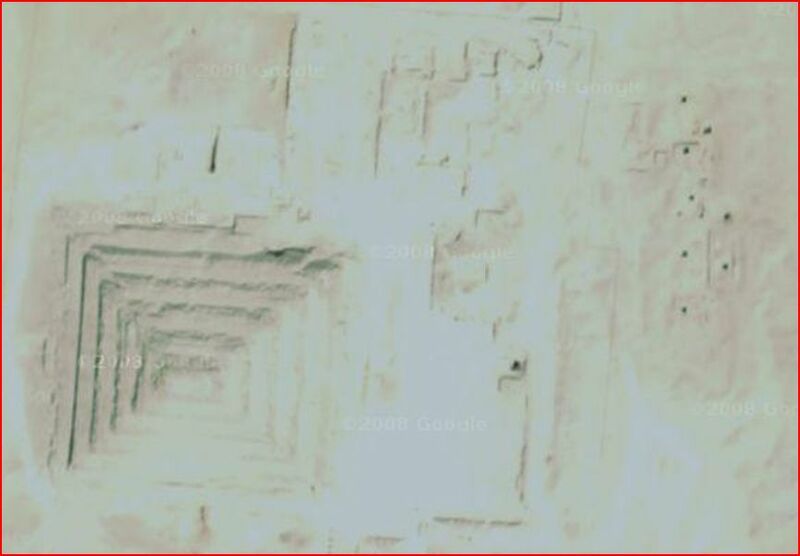 The burial chambers may have been added after the pyramid had been built. Many archaelologists and historians have long noted the similarities between Jospeh of the Bible and Imhotep of the third dynasty and have claimed that Joseph and Imhotep may have been the same person. The difficulty with this theory is that the Egyptian dates do not match the Bibles dates. Recent evidence, however, suggests that the traditional Egyptian dates (which were based on Manetho) may be out by as much as a thousand years (Ref Archaelogist David Down) giving the claim more credence. The Amenemhat III Pyramid at Hawara – The Limestone Venere has fallen down exposing the core composed of millions of mudbricks (which were most likely made by the Jews when they were slaves in Egypt). The Israelites flourished and multiplied while Joseph (Imhotep) was alive. They numbered over a million by the time of the Exodus. By the 12th dynasty, the Pharaohs had forgoten Jospeh (Imhotep) and his connection with the Hebrews. The Egyptians felt threatened by the Israelites and so the Israelites were enslaved by the 12th dynasty pharaohs and forced to make mud bricks. It is likely that many of the Semitic slaves lived in Kahun and made mud bricks for the cores of the 12th dynasty pyramids. After the Exodus, there was not enough slaves to make pyramids any more and so the pyramid age ended. The last great pyramid to be built was that of Amenemhet III at Hawara. Amenemhet III was most likely the pharaoh that Moses fled from. His daughter Sobeknefru was probably the princess that adopted Moses and raised him as her son.